Ready-made proof of concept tools exist and mitigations are hard to deploy and not always effective (for example, DNS pinning is not a panacea and dnswall only filters out private IP addresses in DNS response, protecting from just some attacks). 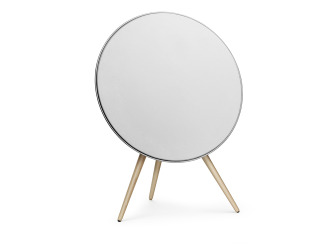 Do you happen to have one of those fancy Bang & Olufsen speakers in your home network? They sound great. They connect to your home network via Ethernet or WiFi, saving the password you input the first time you plug them, and come with a nice web interface. Your WiFi password is of course saved unencrypted, but the interesting thing is that it is present as-is in an unauthenticated page, /1000/Bo_network_settings.asp (no login needed). This means that by just visiting a web page on the local network we can see the password. No big deal, if we consider the LAN a security boundary and if Same-origin policy prevents browsers from reading responses of requests to other origins. 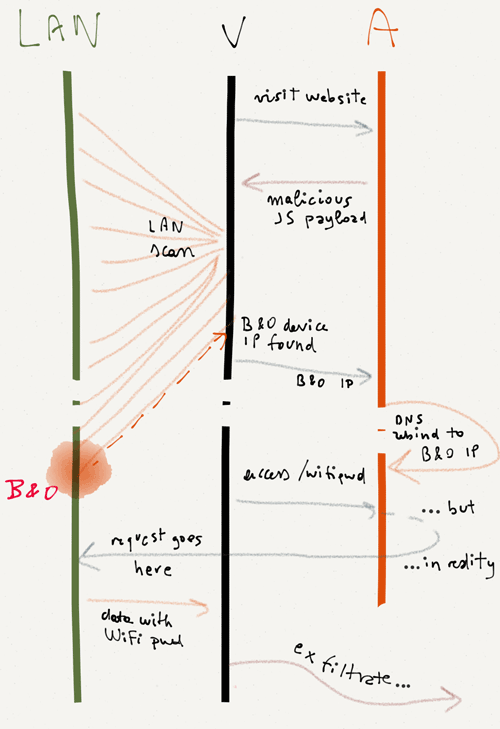 This is where DNS rebinding comes into play. You can get the full source code from this GitHub repo. // with enctype="multipart/form-data". No XSRF protection. // and connect to the attacker-controlled host with the new IP. This has been tested on the latest Chrome, and should work on most browsers except Opera. While having a look at the web interface, I noticed that there seems to be no anti-XSRF protection in the firmware upload page. All an attacker has to do to reflash the device remotely is fetch /1000/bo_restart_in_bsl.asp to trigger a device reboot in service (BSL) mode, wait 30 seconds and upload a custom firmware in /1000/bl_firmware_update.asp POSTing to /goform/formPostHandler a uploadForm form with a appFirmware file. This means that it should be possible to reflash the device remotely even without DNS rebinding, thanks to the XSRF vulnerability. I did not actually try to do that, and there might be some form of signature verification preventing this. Embedded device vendors should be made aware of the risks of DNS rebinding. Since it is difficult to squash this technique in the browser, other precautions should be taken. Web servers should be checking the Host header, especially in devices supposed to be in a local network. It is tricky, and might break some configurations. Network administrators might want to filter private IP addresses out of DNS responses with dnswall, or using external public DNS servers with this filtering, such as OpenDNS. I believe the best mitigation for B&O devices would just be not to reflect the saved WiFi password in /1000/Bo_network_settings.asp (it is in an input type=password anyway, so masked out! ), and employ signature verification for uploading new firmwares, if this is not in place already. DNS rebinding attacks are very practical and real, and mitigations are often not adequate to protect users. This, combined with widespread poor security in embedded devices, makes a wide array of attacks possible. I would like to thank Stephen R. and Sebastian L. for helping in writing the proof of concept code. Update May 13: Bang & Olufsen sent me an update: we have now taken all the needed actions and today we released an updated software for the BeoPlay A9. The product software can be easily updated via the BeoSetup App, over the Internet. The issue is being addressed by removing the sensitive data from the setup webpages, in such a way that the device does not reflect the saved WiFi password back to the clients.